Spare Tire Covers printed and 4x4 tire cover designs. Protect, promote & personalise your 4x4 with a custom spare tire cover. 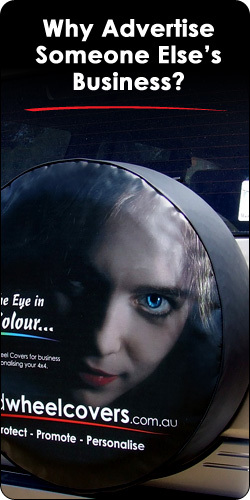 4wd spare tire covers are a great way of promoting your business and products, or to personalise your vehicle. We can incorporate any logo, picture, text or any other design you like in full colour, sure to catch the eye of viewers. Our designer can layout and design a professional custom tire cover for you, or you can send us the art in the correct format and we can manufacture direct from your designs. We also have many pre-designed covers if you like something from our range. Custom 4wd Spare Tire Covers are an effective and inexpensive marketing tool for business, both big and small. Any image or logo printed on your tire cover in full color. Reliable shipping service to most countries world-wide. Hi, i would like to send thanks to you guys for the amazing job on the wheel cover. We were thrilled with it so "thank you". We wont hesitate in recommending your company in the future.